How does one describe Delhi? The capital city of India The capital of the worlds largest democracy. Actually, Delhi is India in miniature. Over the millennia, it has wooed rulers, attracted plunderers, and tried historians with so many details. Today, even as it preserves an enviable heritage, Delhi is a true cosmopolitan city always on the move. 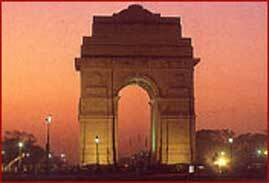 Situated in the northern part of the country, Delhi extends latitude 28.38°N and longitude 77.12°E. It is encircled by the north Indian state of Uttar Pradesh in the east and by Haryana in the other three sides. Delhi is hot and humid in the summers, and cold in the winters. The average temperature ranges from 25°C to 46°C during summer and 2°C to 5°C during winter. The best season to visit Delhi is during the spring seasons of February to April and August to November. The best way to know about the glorious heritage of Delhi is to know its monuments, to travel through time back into centuries of history filled with the rise and fall of dynasties that ruled the land. 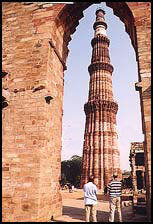 These monuments stretch from Wazirabad in the north to the Qutab and beyond in the south of Delhi. Between these two points, lies scattered the history of this ancient city. According to the Mahabharata, Indraprashtha was the most flourishing city, capital of the Pandavas, with gigantic forts and magnificent palaces. Excavations at the Purana Qila, identified as the site of Indraprashtha, have yielded proofs of the site having remained under continuous occupation up to 1000 bc. The Mauryas, Sungas, Kushans, Guptas, Rajputs, and Mughals held it under their sway. Ferozshah, Muhammad Tughlaqs successor, built his new city northward on the banks of Yamuna. Kotla was the inner citadel of Ferozabad, built like Windsor. It had great palaces and a magnificent mosque. The Fort still retains some of its lost glory. It is the only fort with some well-preserved royal structures to give an idea of the glory of the Mughal Empire. If your image of India is made up mostly of the documentaries they show on the BBC and Discovery Channel on the cable network then the museum is the place for you. The National Museum will let you in on these secrets. The museum houses one of the largest collections of Vedic and pre-Vedic relics, exotic paintings, old manuscripts, and mural paintings from Buddhist shrines in Central Asia. On the bank of the legendary Yamuna, which flows past Delhi, there is Raj Ghatthe last resting place of Mahatma Gandhi, the father of the nation. It has become an essential point of call for all visiting dignitaries. Perhaps the most poignant, the most nostalgic feelings that still bring a tear to many an eye are stirred when one visits 1 Safdarjung Road. Once the permanent residence of the prime ministers of India, it now houses the Indira Gandhi Museum. Here, amongst other memorabilia, lies her saffron bullet-ridden sari, the scorch marks clearly visible even through the glass case. At the center of the city is India Gate, a memorial raised in honor of the Indian soldiers who were martyred during the Afghan war. The green, velvety lawns at India Gate, particularly, are a popular evening and holiday rendezvous for young and old alike. For lovers of flowers ad beauty, the annual spring opening of the glorious, meticulously tended Mughal Gardens at the stately Rashtrapati Bhawan is a bonanza topped by an amazing assembly of roses in perfect bloomperhaps the best in the whole of India. Rashtrapati Bhawan was once the imperial residence of the British viceroys. Built on the Raisina hills of Delhi ridge, this 340-roomed structure has an imposing character overlooking India Gate and Rajpath. It is now the official residence of the president of India. Down on earth, there is the sight of Vigyan Bhawan that has hosted some of the most important international events and summits. There is the sense of history, intermingled with pride as you go past Parliament House, the curiosity as you glance at North and South Blocksthe decision-making, bureaucratic heart of India. Birla Mandir, a Hindu temple dedicated to Lord Vishnu situated in the central Delhi, and Lotus Temple, a beautiful white marble building and a place of worship for Bahais, are two temples worth visiting for those in search of spiritual rejuvenation. The Jantar Mantar, one of the many astronomical observatories constructed by Sawai Jai Singh of Jaipur, is situated in the center of the city near Connaught Place. Many wildlife sanctuaries, heritage sites, hill stations, and quaint little towns surround Delhi. Take your pick and you can be sure of being far from the madding crowdif only for a weekend. Agra, 203 km from Delhi is one of Indias most visited cities for the simple reason that it houses one of the wonders of the worldthe magnificent Taj Mahal. Thirty-seven km from Agra is the town of Fatehpur Sikri, supposedly built on the site where the saint Salim Chisti foretold the birth of Emperor Akbars son. However, even today, pilgrims visit the mosque and tomb built to honor Salim Chisti to seek divine intervention to resolve their problems or fulfill particular desires. If you are in the mood for a shorter trip, then visit Mathura, 145 km away from Delhi on the banks of the Yamuna. It has many places associated with Lord Krishna and its museum has one of the best collections of inscriptions and sculptures. A few kilometers from Mathura is the temple town of Brindavanspend a weekend getting to know the spiritual side of India in these two places. Haryana encloses Delhi on three sides and its many tourist complexes are ideal for quick getaways as most of them are quite close. Damdama, just 64 km from Delhi, makes for a nice break from the rigors of city life. Drive past lush fields and quaint villages to arrive at the lakefront Saras Tourist Complex where you can relax and rest to your hearts content. If you can get away for a little longer, escape to the Morni Hills and let the cool air and scenic beauty revive your spirit. If you are an avid wildlife fan, there are many interesting wildlife sanctuaries where you can escape for a few days without going too far from Delhi. Sultanpur Bird Sanctuary, just 46 km away on National Highway 8, is a birdwatchers paradise with a sizable population of resident and migratory birds. Once a dry belt with a shallow water body that attracted birds during the monsoon, Sultanpur was transformed by the ornithologist Peter Jackson who got the area landscaped and suitable vegetation planted. The best time to visit is after the monsoons when the rains have bequeathed a verdant green cover and the lake is full of fish, frogs, and crustaceans. You can spend endless hours watching the antics of the birdssee the spoonbills wading in the water, the ducks foraging at the waters edge and if you are feeling more adventurous and would like to venture further afield, Bharatpur and Sariska are ideal holiday destinations. The Sariska National Park covers an area of 498 square km and is just a four-hour drive from Delhi. Although a great variety of wild animals are present in the sanctuary, the main attraction here is the magnificent tiger. Bharatpur is interesting both for the Bird Marsh Sanctuary it houses as well as its many ancient monuments. The Keoladeo Ghana National Park, once a great marsh famous for duck shoots held by the raja of Bharatpur, is one of Indias famous bird sanctuariesit is the site where the Siberian cranes come every winter. If you want to escape to the hills, especially during the enervating Delhi summer, you do not have to look too far. Mussoorie, 325 km from Delhi and at an altitude of 6,0007,000 feet, is the favourite haunt of people from Delhi. Mussoorie, with its cool clime, has a lot to offerit is, in fact, known as the Queen of Hill Stations. Twenty-five kilometers away from Mussoorie is another enchanting destination, Dhanaulti, at an altitude of 2,400 m, which offers some of the best views of the Himalayas and plenty of trekking opportunities. Rajasthans proximity to Delhi allows for some fantastic weekend holiday destinationsespecially historical sites and temple towns. Jaipur, just 265 km away makes for a wonderful changethe magnificent forts, palaces and other royal edifices, the colorful bazaars, the skilled craftspeople. Sikar, Fatehpur, Ramgarh, Mahansar, Bissau, Malsisar, Alsisar, Mandawa, Nawalgarh, and Dundlod are some of the important sites. Bikaner, just an overnight train journey from Delhi, is yet another exciting holiday option. There is plenty to see herethe Junagarh Fort, the Lalgarh Palace, and the Ganga Golden Jubilee Museum. Take time off to sample the local delicaciesBikaner has some of the best kachories served with yogurt and the most delicate ghevar, a honeycomb-like sweet. Just seven hours from Delhi by the Shatabdi express, Ajmer is another popular destination in Rajasthanthe Dargah Khwaja Sahib, the tomb of the Muslim saint Khwaja Moinuddin Chisti is a famous pilgrimage site. Ajmer also boasts of the Mayo College, a public school of considerable repute, and several historical monuments. Close by is the sacred lake at Pushkar where there is a temple to Brahma (believed to be the only one of its kind). The fair held in Pushkar in November draws visitors from all over the world. Jodhpur, the gateway to the great Thar Desert, is easily accessible by rail, air, and road. The Mehrangarh Fort, the Umaid Bhawan Palace, Giridkot, and Sardar Marketall these highlight the best of Rajasthani art, craft, and culture. Different communities who have settled in Delhi celebrate their own festivals with great gusto and add color and variety to the cultural fabric of the megapolis. As the capital of India, Delhi is centerstage for many national celebrations, the two most prominent ones being Republic Day on January 26, and Independence Day on August 15. Preparations for these two occasions begin months in advance, especially for Republic Day, which is celebrated with great pomp and pageantry. All along the Rajpath, a grand procession marches by comprising soldiers from the three armed forces as well as the paramilitary forces, bands, schoolchildren, folk dancers, ceremonial elephants, tanks and the latest in Indian military warfare. Air Force planes flying in formation and exhibiting daredevil stunts add to the excitement. Delhi has a great variety of products on offer for a prospective buyer. A favorite haunt of shoppers in Delhi is Chandni Chowk. It started out as a walk for the royal families and had the river Yamuna flowing beside it. The by lanes of Chandni Chowk have been named after the specialty items that are available here. For instance, if you need a break go to Parantha Wali Gali for a delicious lunch of the most crisp and light-stuffed paranthas. Stroll through the lanes and by lanes of Chandni Chowk and you will find everything under the sunwholesale items ranging from hair dryers to spare parts of a BMW. There are whole streets devoted to just one kind of item. The most interesting street in this area is Dariba Kalan where all jewelers have their shopsone of the oldest markets in Delhi dating from the Mughal period. Move to the south and you come across Hauz Khas Village. This is one of the many villages subsumed by the growth of Delhi and still maintains much of the village ambience. The most popular stop is Dastkar that markets goods made by women in villages all across India. Dastkar designers work with groups in the different states taking the traditional decorative arts and applying them in new ways on items that city dwellers snap up. This is a great place for buying gifts. The Santushti Shopping Complex, on the edge of Chanakyapuri diplomatic Enclave, opposite the Samrat Hotel, provides an entirely different experience in shopping. A brainchild of the Air Force Officers Wives Welfare Association, it is the haunt of Delhis beau mondebeautifully landscaped. Of course, if its trinkets and such stuff that interests you, then go to Janpath. Along the pavements, you will find an unending line of shops selling all kinds of trinkets and curios and export-surplus clothes at bargain rates that you can bargain even further! Another place for export-surplus garments is Sarojini Nagar. Palika Bazaar, the underground shopping complex, is a place where you can, again, find almost everything under the sunfrom antiques to the latest electronic contraptionsbut bargaining is essential. For handicrafts, one can visit Dilli Haat and state emporia situated on Baba Kharak Singh Marg near Connaught Place. Most of the multinational brands are available in Delhi through their franchises or at shopping complexes. Delhi is connected to almost all the cities in the country by super-fast and express trains. The city has three major railway stations at New Delhi, Old Delhi, and Nizamuddin. Luxury trains like the Palace-on-Wheels, Fairy Queen, and Royal Orient Express can be taken from Delhi Cantonment railway station. New Delhi is connected to all the major cities of the northern India through road. Buses can be taken from the inter-state bus terminals at Kashmere Gate, Anand Vihar, and Sarai Kale Khan.